Under the current fee structure for probate, estates in England and Wales pay a flat fee of either £215 or £155, with the lower fee charged for executors who use a solicitor. 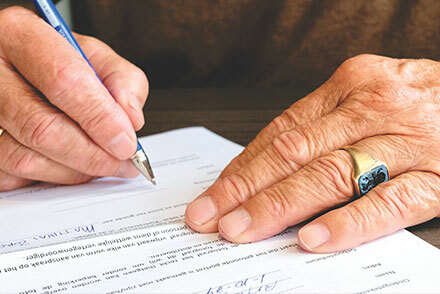 The new probate fees from April 2019 will be linked to the size of the estate on death. For estates valued up to £50,000, there will be no change in probate fees, which will remain at £215 or £155. Estates valued between £50,000 and £300,000 will pay probate fees of £250. This rises to £750 for estates valued between £300,000 and £500,000. For estates worth between £500,000 and £1m, the probate fee will be £2,500. It will be £4,000 for estates between £1m and £1.6m. There’s a £2,500 probate fee for estates valued between £1.6m and £2m, and the highest probate fee of £5,000 will be charged for estates valued over £2m. Estates will never pay more than 0.5% of the estate value in probate fees, but these new fees are substantially higher than existing fees for larger estates. An executor administering an estate worth £500,000 would pay 10 times more than current probate fees. According to the Ministry of Justice, 80% of estates will pay no more than £750 in probate fees under this new tiered charging structure and around 25,000 estates each year will become exempt from the fees. The Ministry of Justice is increasing these fees to raise more money to run and improve the probate service, including the ability to apply for a grant of probate online. Money will also go towards running the courts and tribunal service. One way to reduce the cost burden of these higher probate fees will be to use trusts, where the value is excluded from the calculation of the estate value used to determine probate fees. Where lifetime gifting is used to reduce estate values and future inheritance tax burden, it’s important to construct a comprehensive financial plan in the first instance, in order to consider the risk of running out of money in your lifetime. We have concerns that larger estates which are asset rich but cash poor could struggle with these new probate fees, as it could force the sale of assets to cover the fees. Married couples and civil partners who are exempt from inheritance tax on transfers of assets between spouses are one group likely to be looking for cash to cover these new higher fees. We are waiting to hear more details about how the new probate fees system will  operate and when fees will become payable.